BeeAre: Who wants to wager on the megalomania levels? Who’s got it worse? The Irken Instigator or the Cluster Claptrap? Ok I just started reading these comics and I’m hooked. But I have a question that I would really appreciate if it were answered. 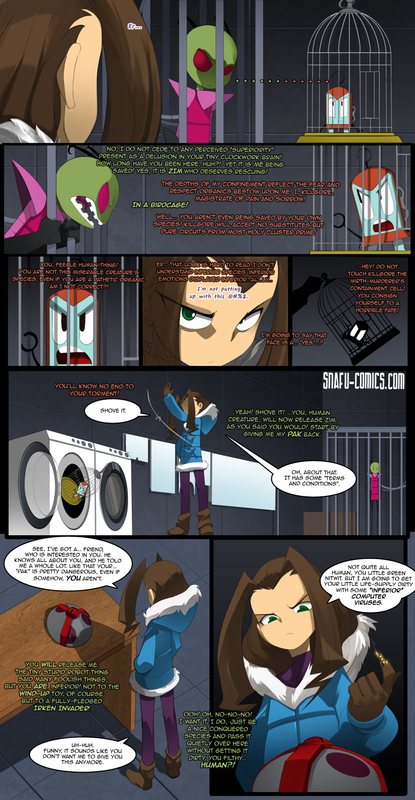 Is Grim Tales a canon future of what happens in this comic in the end or is this some of that alternate ending stuff. -Does that imply that RobotBoy is also part of this comic, if so, how and can his creator intervene in all of this? -And eventually knowing how the heck would Dexter put himself out of the misery he accidentally put himself in. But mostly, Proto-Boy. I love galactic conflicts. I’m astounded that after over ten years of comic the biggest thing being asked for right now is PPG/RRB stuff. I believe BeeAre has already pointed out that he is not going to make any colour-matched pairing happen… so don’t hold your breath for that. Some people are just never satisfied…they’ll learn at some point. With all due respect, but what we really want are the PPG, especially when the RRB come back, which will generate many internal conflicts between them. I even understand the purpose of these flashbacks is to show the past of some characters, but this is taking too long. how did i miss the two life preserving tubes on Zims back. damn i must be losing my eyesight. I love this so much!!! I’m also so glad the RowdyRuff Boys are in it! Question; Even if there isn’t any Blossick action (my OTP btw) will they at least become friends eventually? Just wondering, can’t wait for the next update!!! So much superfluous text on one page. Didn’t even bother reading half of it. Can we finally switch back to the PPG’s, please? FINALLY SOMEONE COMENTED WHAT I FEEL !!! I left so I could work on myself, so I wouldn’t be so sensitive. I’ll come back to the Comments someday. It was so nice to see you again! 🙂 See you later!